DVLA has announced an accelerated rollout of the new red V5C (the vehicle log book). DVLA introduced a new red V5C in August 2010. The new red V5C is more secure, more customer friendly and highlights the need for buyers to check the legitimacy of the vehicle presented for sale. 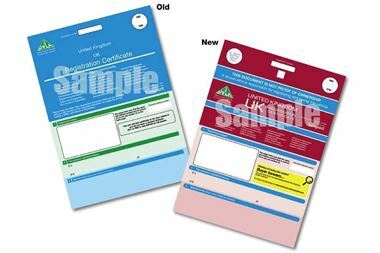 From 4th September 2011, when a vehicle is taxed or declared off the road (SORN), DVLA will automatically send the registered keeper a new red V5C if they haven’t already been issued with one. Registered keepers will be advised to destroy their blue V5C and to use the new document in any future dealings with DVLA or the Post Office®. As part of this process an insert giving customer advice will be included with V5Cs.